My business is growing by the day. The more horses that I work on, the more feeling and intuitive and capable I become. It is an incredible method, and while I am so happy that I have pursued the dissection courses as well as the biomechanics courses, I realize that Jim Masterson was right all along, “You don’t have to worry about being perfectly on a certain acupressure point for example, just watch the horse as the horse will tell you.” Staying inside the brace response and going lighter when you feel or see a reaction is key and it is what makes this technique so incredible. Now not only am I a Mentor and a Coach , Jim recently made me an Instructor. And not only will I teach the 2-Day clinics that I host locally, I will teach all around California! Timing is everything as I feel calm and confident and yet excited about it. I worked at the Western States Horse Expo with Jim in early June. I did two demos with him in front of the crowd as he did his clinics. A year ago my guts would have been in a knot about that. 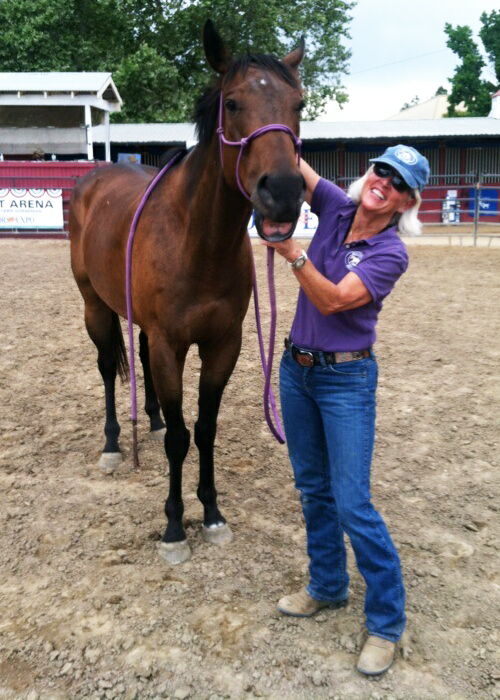 I worked with a rescued Mustang and a high-strung OTB. I just told myself to not think about the people and “stay true to the horse”. Well, they both figured out pretty quickly that they liked the work and calmed right down—heaven on earth. I am very happy that I have not pursued another technique to add to my toolbox as that would have kept me in my “head” and in the “trying to remember what I am supposed to do”. By staying so deep in the Masterson Method—and having now worked on several hundred horses—my fingertips, my eye, my experience along with my education, just keep becoming more fine tuned. 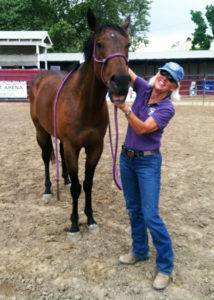 I am all things Masterson, added to my lifetime of riding and loving and appreciating horses.